Yet, for some reason, we find imagery to be the website content that clients give very little budget and very little time considering when working on a new website design. We already know that it takes less than 5 seconds for a visitor on your website to make a decision on whether you can meet their needs and do it well. (See also: Three Website Design Tips that Will Change How Your Website Sells. ) If your website design doesn't give the visitor the "feeling" that makes them want to continue in those first 5 seconds, you've lost a potential customer. And what is the one thing that is most likely to contribute to the feeling that is created? An image. Maybe there are several images that rotate, maybe it's a video, or maybe it's just one large image that tells a story about who you are and what you do. But in almost every case that image will support the words that you're stating on the website, even if the visitor doesn't read all of it. They may only get as far as what your website looks like before making a decision to stay or go on. Literally your choice of imagery could have the power to keep people on the website or send them on to a competitor. What Kind of Imagery Should You Use? So here's the thing about images: they're not the cheapest things on earth. But just like you've made the commitment to promote yourself in a professional way through your web design and your marketing efforts, you also need to commit to images that make sense, represent the quality of your organization and aren't overused. It can literally be the difference between generating a lead and the potential lead leaving your website because it doesn't meet their expectations. In many cases this means you need to have photos taken, but not always. Here are the two paths that you can take when it comes to website imagery. Showing your product at its best angle or sharing the experience that customers have when they choose your company is ideal. And really the only way to do that is to set up your own photo shoot. This allows you to create the feeling you want the website visitor to have about your company and/or product. 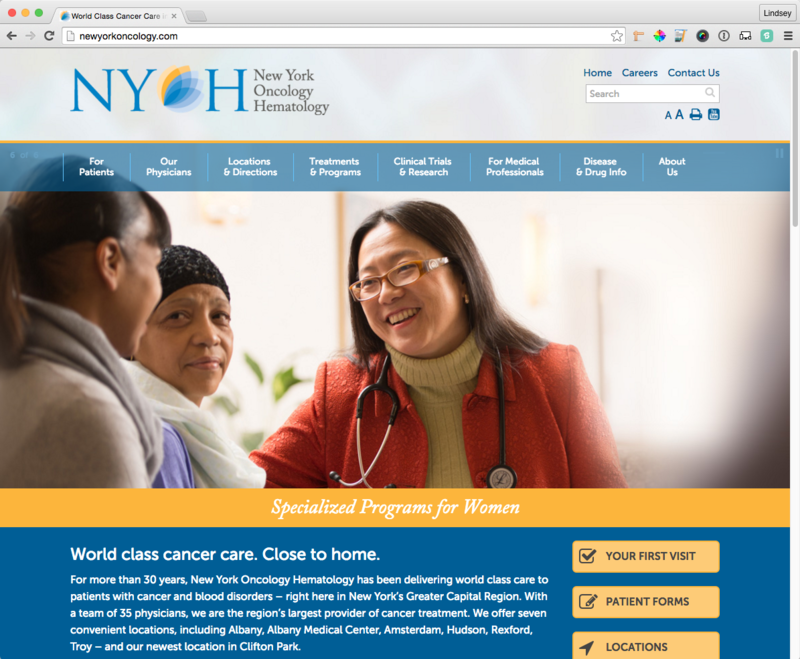 Here's an example of a specialty medical practice in New York that conducted their own photoshoot for cancer treatment. When you come to this website you'll get the overall feeling that they want you to have about being a patient there. Something else we hear a lot is that the client wants to "re-shoot" when there's been a staff change. In most cases it's perfectly acceptable to leave a photo on your website after a staff member pictured changes jobs or leaves the company. The particular staff member in the New York Oncology image may move on to a new job in the future, but the picture is still a valid representation of how they care for patients and there's no need to change it unless it's no longer representative of how the practice functions. Most people think, "We'll use stock photos because it's a lot cheaper than doing our own photoshoot." But the price of really good stock imagery can be high -- in the range of a few hundred dollars or more per picture. With stock photography, the less expensive the picture, you're likely to get less quality and more use by other companies. There are a few stock images that we've seen on multiple occasions for similar types of companies. If you're going to use stock imagery, try to find pictures that really represent you. You want to stand out, express the right feeling and have the right "look". If you can find the right stock photo, go for it. But we have literally spent hours trying to find the right photo for clients and in some cases never really find something we're 100% happy with. 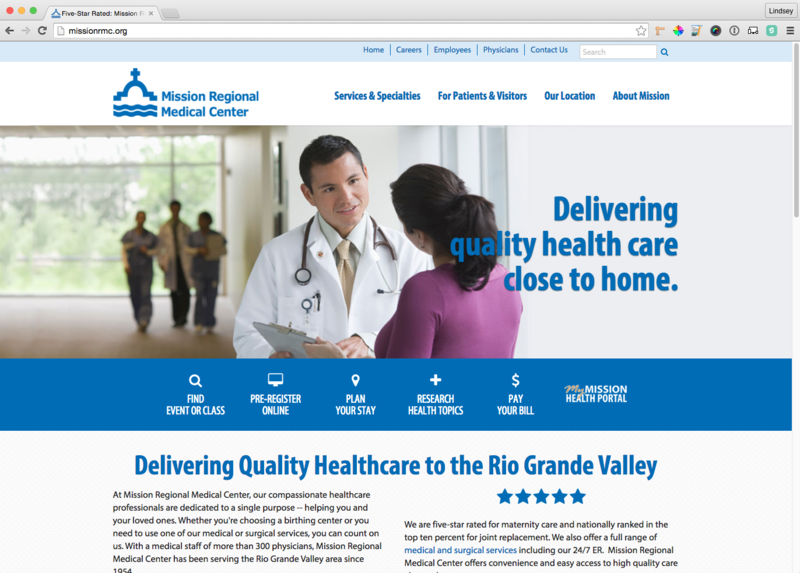 The example below from Mission Regional Medical Center shows a stock image we found for their website showing a Hispanic doctor speaking to a woman who you can imagine may also be Hispanic. This was a critical requirement for the photo we chose in order to match the demographics of South Texas. We spent time finding quite a few images in this genre that felt similar, and expressed the same type of feeling. This isn't always the easiest thing to do in order to get the result you want. Here are some pro tips to help you decide which type of photo gathering would best suit you. Keep in mind that ultimately you want to use imagery that matches your marketing strategy and brand, without breaking the bank. Depending on what you need, a proprietary shoot could be less expensive in the long run. Be sure you talk to your photographer about what kind of photos you want, examples of a style you like and how you're going to use the photos. If this is primarily for website usage odds are good you need most photos to be horizontally oriented. This process will also help you think through the number of locations you need to shoot in so that the photographer can quote the most realistic price for you. Taking photos on your phone or even with a camera that you own is not the same as hiring a professional. The photographer will have high resolution equipment but more importantly they have an eye for composition, lighting and bringing out the emotion in photos that most people can't do if this is not their professional career. Be sure the photographer doesn't zoom in too close on the subject. This will allow you to crop images to suit your needs so you don't end up with an odd looking segment of a picture that was really cool when you could see the whole thing. 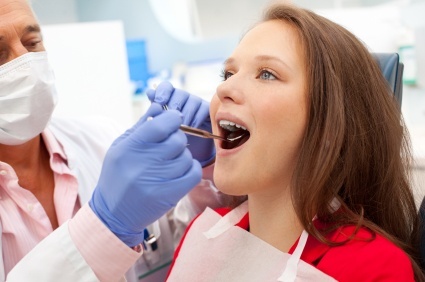 In the full size image above you see the dentist and the patient and get a feel for the office's surroundings. Now look at the cropped version that could be the approximate dimensions of a home page website banner image below. When we crop the image you almost can't see the dentist and you may not be able to understand what you're looking at in the background. Because the staff and the state of the art office are often an important part of healthcare marketing, this photo might not work as well because the subject is too close to the camera. You can do a search to see if the photo you want to use is being used in other places on the web. Google's Reverse Image Lookup lets you see where else the picture can be found online. Give this a try before you buy a picture to be sure it's not something your primary competitor has already used. If, in the rare event, you find the perfect picture someplace free like Wikipedia you will need to read the copyright rules for each picture. Some pictures can be re-used without credit, others you can use for free but need to credit the source. Wikipedia typically isn't a good place to find photos that will meet all the criteria you need to support your marketing strategy. Don't rely on Photoshop to make a stock photo fit what you need. Don't get me wrong, we have done some amazing things in the past to pictures that weren't quite right. But it's not quick or free to alter images. And even then, there's only so much we can do without it looking fake. It's better to start with a photo that matches your needs as closely as possible. Budget for photography as a part of your marketing plan periodically so that you have pictures that you're proud to use on the website and in other ways to represent the company. Whether they're great stock pictures or your own -- the investment will improve your overall brand value and your potential customers' perspective of the company. Photography is just one of many things we help our clients consider, especially in health care, when working on a website redesign. For more information on things you need when redesigning your website, download our free ebook by clicking below.